Basic is always 'easy'. This creation is literally basic in its color tone - black with bits of white. 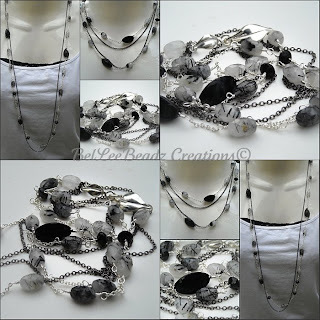 Black rutilated quartz faceted ovals, smooth elongated black agate and black onyx rondells, lightly oxidized bead spacers and chain make up this 2 layered necklace which measures approx 34" and can be worn wound 2 x round the neck. Ends with a pretty sterling silver leaf fastener.